Optometrist Katherine Weise examines a young patient. Millions of children use digital devices - computers, cell phones, televisions - for three or more hours a day for education and recreation. Studies show that too much screen time is causing physical and psychological issues in young people. One study, published in the journal PLOS One, says school-aged children who spent seven or more hours a week using devices tripled their risk for myopia, or nearsightedness. 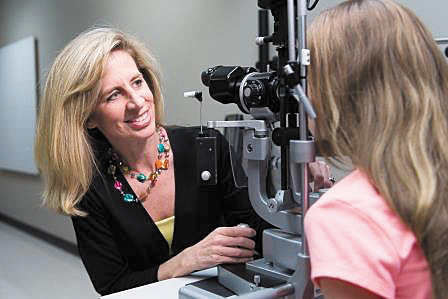 Katherine Weise, OD, MBA, FAAO, at the UAB School of Optometry, says the prevalence of nearsightedness has increased worldwide in recent years. In the United States and Europe, nearly half of young adults have the condition, which is double the prevalence of 50 years ago. Rates are even higher in Asia, where the prevalence has reached 90 percent in many areas. "Two studied causes of nearsightedness are near-work and lack of time spent outdoors," Weise says. "In addition to those factors, you will have a twofold risk of developing the condition if you have one parent who is nearsighted and a five to sevenfold risk if you have two parents with the condition. But studies are showing that lack of outdoor time may be a big factor." Literature indicates that outdoor play may have a protective effect on nearsightedness, which causes distance blur that gets worse as the condition increases. Sunlight could play an important role in protecting vision, possibly because it triggers dopamine, a neurotransmitter that keeps the eye from getting too elongated during childhood. "We can't change the genetic component, but we are trying to find modifiable environmental factors that affect the growth of the eye," Weise says. "Some studies show that being outdoors has a protective effect on eye growth. Even 15 to 30 minutes a day can be helpful, but up to two hours per day outdoors may be best." Weise believes that Circadian rhythm may also play a role in myopia development. "Structures of the eye go through daily variations that may be related to light exposure. One theory is that you need high highs and dark lows for the natural growth of the eye. Children who spend a lot of time indoors may not get the high highs from the sunlight. If they go to bed with their electronic device, they may not be getting the dark lows. You want dark to sleep and light for play," she says. "If the child uses a device to fall asleep, the light may influence eye growth and lead to increased nearsightedness. In the shorter term, the light may simply keep a child awake longer, increasing fatigue and the chance for eyestrain the following day." Dry eye is another condition that can result from too much screen time. "When you blink, you squeeze tears that moisten your eye. When you are looking at a device, you don't blink as much and your eyes tend to get dry and irritated," Weise says. While researchers work on determining the influence of screen time, near-work, and outdoor play on the eye, parents can consider some of their own modifiable factors for their kids. Limiting screen time may be beneficial for a variety of reasons. Anti-glare coatings on glasses may be helpful. "Nothing is a silver bullet," Weise says, "but avoiding the device use at night, getting outdoors for two hours per day, and taking a 20-second break every 20 minutes of near-work (reading or on a device) may be a step in the right direction." 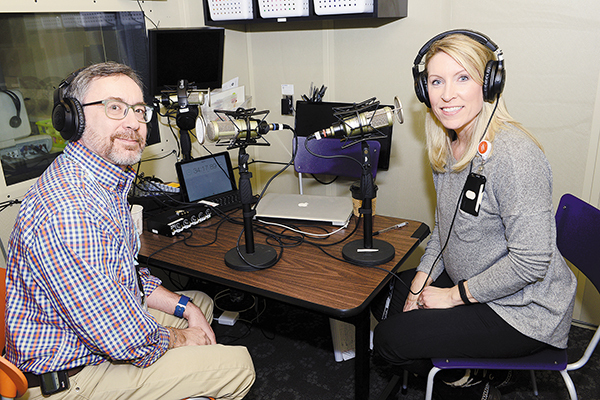 Daniel Marullo, left, participates in a podcast on the topic of suicide. Obesity also can occur as a result of the use of electronic screen devices, which require a person to sit. "Childhood obesity is an epidemic in most countries. Research shows that too much screen time is the biggest contributing factor," says Daniel Marullo, PhD, a pediatric psychologist and neuropsychologist at Children's of Alabama. "When a child uses a device, he or she is not being physically active. For infants and toddlers, it can also have an impact on language development and socials skills." Children also can develop psychological issues related to too much screen time, including a lack of social skills. "In addition to the social component, games and content can be stimulating which makes it harder to go to sleep. Also, the blue light can make it difficult to initiate sleep. Studies show that the mere presence of television in the room can affect a child's sleep," Marullo says. He adds that parents sometimes use videos and other devices to soothe toddlers into sleep. "There is a concern that some children aren't learning to self-soothe and are relying more on media for sleep. Many times, they can't go to sleep without the background noise and that teaches bad sleep habits." There is controversy over whether computer games can affect aggression. Studies have shown that teens who spend a lot of time watching violent television shows or playing violent video games are more likely to be aggressive both at home and school. "Earlier studies suggested a link between violent content and aggressive behavior," Marullo says. "However, better analyses show that this research did not account for variables like family background and pre-existing mental illness. Is there a link? It's still an open question." The American Academy of Pediatrics and the American Psychological Association have suggested guidelines for healthy screen time, based on age. For children up to two, they suggest no screen time. "These babies need to be held and cuddled. They also need to explore," Marullo says. For toddlers and preschoolers, guidelines suggest no more than one hour, spread out over the day. For those six and older, parents should put limits on devices and make meal time device-free. Stop device use at least one hour before bedtime, and make sure the child has a wide range of activities during the day. Marullo says parents can help by modeling good device habits. "Children learn from their parents first. If you make a rule of no cell phones at the dinner table, don't whip out your phone. For toddlers, promote activities that teach language skills, such as watching educational television shows. There also are some good language apps," he says. "But when using these things, make sure you do them with your child, especially when they are young. Teach children how to use devices properly from an early age." For older children, parents should monitor what they are doing on their devices. "Be a curious parent and make sure you know what's going on. Be mindful of the apps they are using and the sites they are visiting. Just like you want to know who your children's friends are and where they go when they leave the house, it's the same thing with devices," Marullo says. "Part of monitoring is watching for bullying. It happens everywhere but is especially damaging online. It happens behind the scenes where nobody sees it, so teach your child to be respectful of others. And make sure they know that nothing is private on the internet."